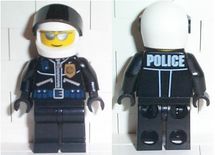 Police Officer is a minifigure that appears in various City and Education sets from 2005. Most officers have a suit with a blue tie and a golden badge printed on a black torso with black arms and yellow hands, with one variant sporting black gloves. One variant uses a jumpsuit printed on a black torso with zippers, a belt, a radio, and a golden badge with "POLICE" printed on the back. These have black arms and dark stone grey hands. All sport black legs. Officers sport either a white baseball cap, helmet with transparent brown visor, or hat. Facts about "Police Officer (2005)"